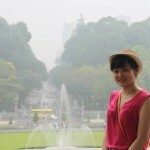 Hello blog readers, I’m Alisa Le. I’m from Vietnam and this is already my 5th year in the UK. I graduated A-levels in Wolverhampton, a small town about 20 mins train from Birmingham. I’m about to start my third year of BSc Financial Economics. I’m so excited to be the student blogger of economics department. I would do my best to provide you, current and prospective students with all the university updates and sometimes my takes on certain events. To start off, let me give you some facts about your new student blogger. – “Addicted to” TV shows from Korean to British, American TV series, game shows. Even more excited about crime-related shows and period dramas. – Travelling with my 50D Canon Camera. – Have a great passion for psychology. I studied psychology in A-level and did consider applying for a psychology course. I like reading all the books that explain why people behave the way they do. Favourite book: Why We Love: The Nature and Chemistry of Romantic Love by Helen Fisher. First impression of Leicester University: On that open day, I remember the weather was very cold and dull even. I remember I was just walking leisurely around the university when I saw the grass field in front of Fielding Johnson building, right next to the Economics department building. The field was green and somehow so lively, with colourful flowers all around. I know at that moment, I want to study here. This seems like a strange even a bit cliché reason but I do think that I should trust my gut when it comes to big decision like choosing university. And my gut said Leicester. So that’s a bit about me. I would try to update my blog every week, but if for any special reason I can’t, please bear with me. Alisa graduated in the Summer of 2014 and is no longer blogging for this site. Alisa, a student from Vietnam, blogged about her third year of BSc Financial Economics and her time as a Course Representative. Hello Alisa and welcome! Your three first blogs were great so keep up the good work!